This is a somewhat large project, combining two ‘experiments’ I wanted to try: providing environmental monitoring with ESP8266-based sensors and using NET-SNMP’s extend facility to interface external data to SNMP. Long ago, I managed a large international network with hundreds of routers. SNMP was used heavily to monitor many aspects of the network. Then I ended up managing a data center. The building monitoring systems were a hodge-podge so I figured out how to convert each system to an SNMP-based monitoring system. That allowed all building systems to be monitored from the same SNMP console that I knew exhaustively. I would have liked to have placed temperature sensors in every rack in the data center, but it was cost prohibitive. The devices we were using at the time were hundreds of dollars each so there weren’t many of them (a quick check shows the cheapest current models to cost $200). So I have long wanted to come up with a system where I could place several DS18B20 temp sensors in each rack and tie perhaps a few racks together with an MCU and a network connections. That desire is the basis for this project. Here is a diagram of the concept I’m implementing in this post. While the broad idea would be to support multiple ESP8266’s with multiple temperature sensors on each ESP8266, for this experiment, I will implement one ESP8266 with one temperature sensor. The Raspberry Pi receives the temperature update and writes it to a file. The file is named after the MAC address (allowing for multiple ESP8266’s). The SNMP server will then use the contents of that file if an SNMP request is made for the temperature. Here are some of the resources I used when creating this project. 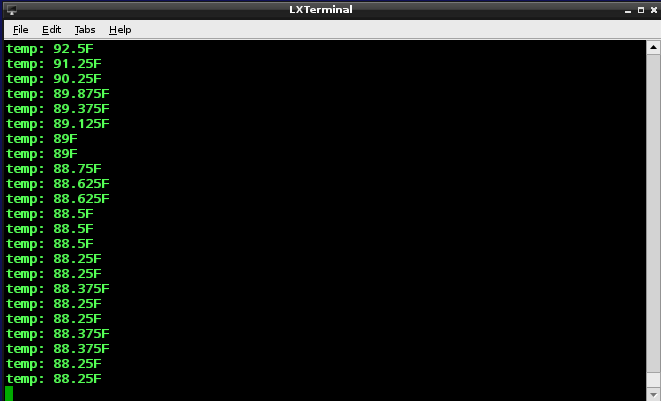 NET-SNMP-EXTEND-MIB::nsExtendOutput1Line. "test1" = STRING: Hello, world! NET-SNMP-EXTEND-MIB::nsExtendOutput1Line. "test2" = STRING: Hello, world! snmpwalk should give you 2 test OID (test1 and test2) and both will have the value ‘Hello World’. extend    test1   /bin/echo  Hello, world! and the snmpwalk above should properly return the ‘hello world’ lines. If not, you need to troubleshoot until you resolve the problem, as the succeeding steps require extended SNMP. Every 10 seconds, I will read the temperature from the DS18B20, then transmit that and the ESP8266’s MAC address via UDP (port 9999) to the RPI. Note the temperature transmitted is in Celsius * 10000 to get rid of the decimal point. The Raspberry Pi can handle floating point and will convert it to floating point Fahrenheit. The ESP8266 program consists of the file getTemp.lua and init.lua. 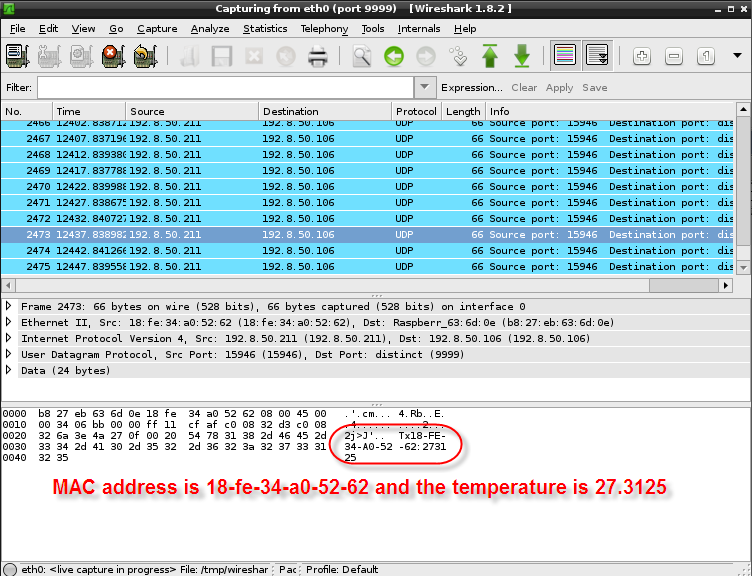 I am going to modify that program slightly to receive the data packet from the ESP8266, split the MAC address from the temperature, convert the temperature to fahrenheit, and finally write the temperature to a file named after the MAC address. -- Setup UDP socket. Bind to localhost, port 9999. Now that the temperature is being recorded properly into a file, we merely need to get SNMP to recognize this data. This is really quite easy to do. The name of this OID will be ‘tempSensor01’. When that OID is retrieved, it will execute the shell command ‘cat /tmp/18-FE-34-A0-52-62; exit 35‘. The output of that command is sent back to the SNMP console. Putting together these various tools works quite well and the goal to allow an SNMP console the ability to read ESP8266-based is (very) roughly achieved. This is a long ways from a usable project, but I at least proved the concept to myself. The one glaring issue that must be addressed to make this usable is the fact that the temperature is being returned as a string and not an integer. That makes it hard to apply tests and set alarms (for example, if the temp were > 100 I might want to set an alarm on the management console). From what I’ve seen of the Net-SNMP EXTEND facility so far, it appears this is doable, but would require writing an actual MIB. Not hard, but beyond the scope of this little ‘experiment’. This entry was posted in c-esp8266, c-rpi. Bookmark the permalink. I would like to read more than 5 sensors DS18b20 and send data to my mobile phone. How could I modify Your program ? Nice job. I am doing the same project as yours. 1. Is snmpd the same as net-snmp? 3. I heard we should make a MIB file for our device(sensor for example) in SNMP communication, but you did not. Is it correct?! 1. The daemon, snmpd, is just part of the entire snmp package. Just looking around briefly it looks like it may be called snmp-static for openwrt. See http://www.it-slav.net/blogs/2010/03/23/install-snmp-on-openwrt/. 3. I did not create my own MIB because I used the ‘extend’ option of net-snmp (look at https://wiki.opennms.org/wiki/Net-snmp_extend_collections). I’ve written a couple of MIBs, and while not overly difficult, it isn’t simple either – especially the first time. The extended MIB lets you get to device data without having to write your own MIB. For quick and dirty it’s a great option. For production work, or stuff you want to share with others (or if an instructor requires it), then write your own MIB. Thanks Dan, it really works for me. the question is do all network management station (NMS) applications like cacti or nagios can understand numbers in string. I want to draw some chart in time, by sensor data in these application. I tried coding in shell and c and … all of them return values in “string” or by some trick in “int” data type. do you think we can some how return value in float data type? You are correct, NMS systems are not going to be happy with a number embedded in a string if you intend to do any computations. I have one more question about SNMP. Does the solution you have described (I mean extend snmp) work for snmp trap too? or in other words, can we get trap from an executable file that is defined as extend snmp? I don’t know how to do this. I’m fairly certain the extend extension won’t support traps. There is an SNMP protocol called AGENTX that might be able to, but it isn’t clear to me how. If you are to the level of complexity of wanting to support traps, you may be better off writing and compiling a MIB for the traps. 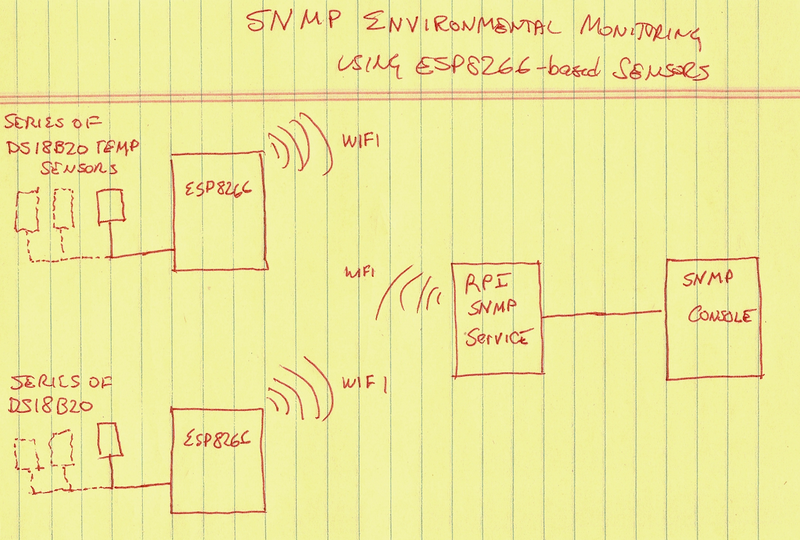 I believe you could then use snmptraps utility to transmit the traps to the net management station. without create a MIB ? Something that is s extended trap! It has been a long time since I’ve used SNMP, but from what I recall, the management console is not going to know how to interpret a trap if it isn’t assigned a to MIB compiled into the management console. The only way I’ve found to NOT write a MIB is to use the extend MIB. If the extend MIB is not sufficient, you probably must write a MIB. I wrote a long MIB years ago. Writing a MIB is not very hard. If you must write a MIB, you can find an example MIB to copy and modify as necessary.